Wahoo! We're so pumped you're registered for this backpacking adventure to the Lost Coast, the most remote, rugged section of California's coastline. You'll find most of the info you need to prepare for your trip on this page, but we'll email you the week of the trip with final details about our any final updates, carpools, and bios from the other rad ladies who'll be joining you. We'll be sleeping right next to the beach in true backcountry campsites! We can pitch our tents wherever we want to within the bounds of Leave No Trace principles (more than 200 feet away from trails and water, in spots that already look impacted). We'll gather water from streams and purify it for drinking, and dig holes in the ground to poop in. Lunch & dinner on Day 1, breakfast, lunch & dinner on Day 2 (and Day 3 for 4-day trips), and breakfast & lunch on the final day will be provided. The group will share in cooking and cleanup responsibilities. Please arrive on Day 1 with breakfast and coffee already in your bellies! We’ll eat tasty hot meals for breakfast and dinner. Each Maven will create her own ‘snack bag’ at the start of the trip, with dried fruit, nuts, chocolate, jerky, granola bars, etc. To keep our energy up, we’ll snack throughout the day on trail, rather than having a single lunch meal. We’ll have more than enough snacks for you (think: bars, nuts, dried fruit, jerky for meat eaters) but if you’ve got any favorite trail treats, feel free to bring them. Don't be deceived into thinking beach hiking is easy! The terrain ranges from soft sand to wobbly, bowling-ball sized rocks. Expect rough terrain, stream crossings, some bushwhacking, and the chance to practice your decision-making and navigation skills, as Lost Coast trails are quite rugged and overgrown. Day One: 5.1 total miles from our cars at Black Sands Beach Trailhead to Buck Creek. We'll climb 396' over the course of this hike along the beach. Click here for a distance/elevation profile. Day Two: 6.8 total miles from Buck Creek to Saddle Mountain. We'll ascend a whopping 3150' over 3.5 miles, basking in the glorious views, until we hit the summit of Saddle Mountain. Then we'll head back down for a much-deserved happy hour. Click here for a distance/elevation profile. Day Three: 5.1 total miles from Buck Creek to our cars at Black Sands Beach trailhead, all on the beach. Day One: After taking a shuttle from Black Sands Beach (where we'll leave our cars), we'll hike 6.5 total miles from Mattole to our first night's camp at Cooskie Creek. We'll climb 340' over the course of this hike along the beach. Click here for a distance/elevation profile. Day Two: 10 total miles from Cooskie Creek to Big Flat Creek, gaining 312' in elevation. Click here for a distance/elevation profile. Day Three: 8.5 total miles from Big Flat Creek to our cars at Black Sands Beach trailhead, gain 638' in elevation. Click here for a distance/elevation profile. Day One: After taking a shuttle from Black Sands Beach (where we'll leave our cars), we'll hike 2.5 total miles from Mattole to our first night's camp at Punta Gorda. We'll climb 123' over the course of this hike along the beach. 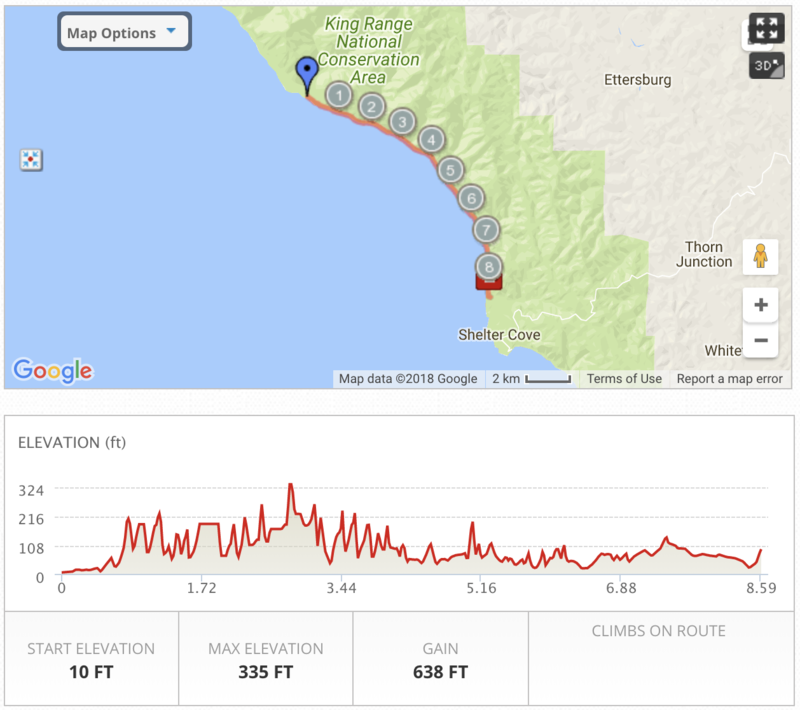 Click here for a distance/elevation profile. Day Two: 9.6 total miles from Punta Gorda to Kinsey Creek, gaining 395' in elevation. Click here for a distance/elevation profile. Day Three: 4.7 total miles from Kinsey Creek to Miller Flat, gaining 156' in elevation. Click here for a distance/elevation profile. Day Four: 8.5 total miles from Miller Flat back to our cars at Black Sands Beach, gaining 638' in elevation. Click here for a distance/elevation profile. The Lost Coast is black bear country, and Trail Mavens takes every precaution when traveling in bear habitat by storing food, drinks, toiletries, and trash in bear-resistant containers. While it's very unlikely we'll spot a bear on our trip - we'd be lucky if we did! - you can be prepared by reading REI's brief on backpacking in bear country. Our group will pack together before setting off on the trail. In addition to your personal effects, you'll carry some group gear and group food. Your guide will teach a packing lesson, and help you decide which gear to carry and what, potentially, to leave behind. As noted above, the Lost Coast is black bear country, and we must store anything scented in our bear-resistant canisters, including toiletries. The canisters have limited space, so plan to leave behind non-essentials. We recommend toothpaste, a toothbrush, contact lens supplies, and lip balm. The group will share sunscreen, insect repellent, and hand sanitizer. Feel free to bring those on the trip, but we may end up leaving yours in a car at the trailhead. Please do not bring deodorant, makeup, or large packs of disposable wipes. Each Trail Maven should plan on packing the following items. Items in bold will be provided for those women who indicated they needed them during registration. SHARED ITEMS, PROVIDED BY TRAIL MAVENS: tents, food, bear-resistant canisters, stoves, fuel, cookware, camp chairs, utensils, and basic First Aid. A clean set of clothes to change into for the drive home! You'll leave these in the car so they're waiting for you when we leave. Click here for the Lost Coast weather forecast as we approach our trip. It's the rainiest place in the Continental United States, so don't be surprised if there's precipitation in the forecast. Since everybody is different, it’s up to YOU to check out the weather forecast and judge your personal comfort levels, and plan accordingly! Please use your own judgement when packing: if you’re always cold, pack heavier extra layers (i.e., leggings to go under pants). Trail Mavens is committed to following and teaching Leave No Trace principles. To get you started, watch this video on LNT Outdoor Ethics from the National Parks Service. Trail Mavens often enjoy wine or whiskey together in the evenings. Participation in drinking is welcome but of course not mandatory. We ask that Trail Mavens leave recreational drugs at home. If you’re a smoker, please be respectful and partake in a manner that doesn’t bother other group members, and adheres to Leave No Trace principles. This is an internet-free weekend (plus, we won’t have cell service)! If you’d like to share your pics on social media, go for it, but only after we get backhome. Then, feel free to go crazy tagging @trailmavens on Instagram or Twitter. Your tent is your home for the weekend, so you want to keep it clean and tidy! Keep the door zipped shut unless you’re getting in or out. Consume only water inside your tent to keep it scent-free, and store anything smelly, including toiletries, in a bear canister. High-end tent fabric is very delicate; keep shoes and anything else dirty or sharp outside. Set up your sleeping bag inside your tent to keep both your bag and your tent clean. Our pads are inflatable, meaning they’re a) quite comfortable and b) can pop if they meet a sharp rock. Be sure to unpack, inflate, deflate, and pack your pad inside your tent, away from anything sharp. This will ensure a comfortable night of sleep for you and a clean tent. Make sure to remove all food, trash, and scented items from your pack as soon as we arrive at our campsite. Hydrate, hydrate, hydrate! Start off on the right foot by drinking a lot of water starting the day before your trip, and thinking about drinking even more than you would ordinarily while out on the trail. If you've never been backpacking before, consider going on a few training hikes carrying a heavier pack before our adventure. You'll be carrying 30-35 lbs. on your back, and it's good to know what that feels like! Stream crossings and boulder scrambling are a certainty on this trip, and for the May/September itinerary, so is tree-fall hopping and hacking our way through some overgrowth on the trails (they don't call it the Lost Coast for nothing!). Still scratching your head about something before the trip?